I received a complimentary copy of this book from the author/publisher through BookLook Bloggers. I was not required to write a positive review. All opinions expressed are mine alone. I looooove the Jesus Calling devotionals. I may have more than two…or more than three…Okay, so I have four different ones. And I love them all. 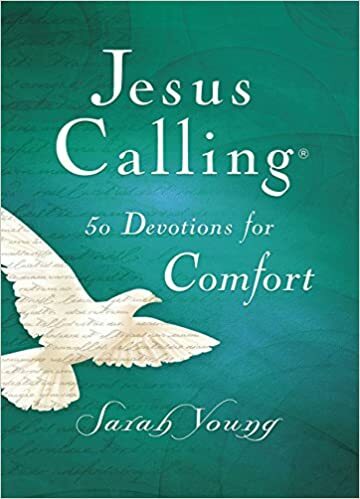 I was very excited to see this one come available for review, because who doesn’t need comfort from Jesus? I love how these devotionals are written, as Jesus speaking to us. It feels very personal, and I definitely believe that the Lord uses them. There have been so many times where I am feeling low or discouraged, etc. and open to a devotional page and it’s exactly what I needed to hear. In this one, they are the devos selected from the bigger one, Jesus Calling, so I have read them before, but many seem like reading them new, and they do share immense comfort. And the artwork! Oh my. I wasn’t expecting that, but each devotional page has a piece of art on the other side with a verse scripted across it, and then also some pages in between devotionals with Bible verses elegantly scripted across a lovely scene. It really is beautiful, and so peaceful and calming. So yes, I definitely recommend this devotional, as well as the other Jesus Calling devotionals! Previous Post Author Interview: Lindsay Harrel! With GIVEAWAY!